Every Thursday throughout the summer, Knight Sports Now has been taking a look at UCF Football’s best game in each of their years competing at the FBS level as part of a Throwback Thursday series. As we hit the final stretch, we’ll be turning back the clock every day leading up to the 2018 season. Today, we continue with 2016. 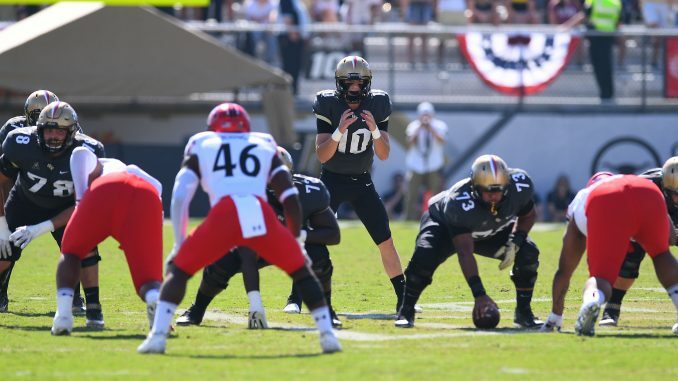 UCF’s winless 2015 season was a low point for the program. But fortunately, it was a low point that didn’t last long. Former Oregon offensive coordinator Scott Frost was hired in December of 2015 and he quickly got the Knights back on track. 2016 wasn’t always pretty, but UCF got back to a point where it was competitive in nearly every game it played. The Knights were 4-4 through eight games, sitting in a nice position to reach bowl eligibility just one year after going 0-12. They routed Tulane, 37-6, on the first weekend of November. A week later, they had a chance to clinch a bowl berth at home against Cincinnati. That opportunity didn’t go to waste, as Frost’s team dominated the Bearcats by a score of 24-3. Matthew Wright gave UCF an early lead on a 22-yard field goal before McKenzie Milton connected with Dredrick Snelson for a one-yard touchdown. Cincinnati struggled to get much going offensively, with its only points coming on a field goal in the second quarter. The Knights padded their lead in the third quarter with a big special teams play. Tre Neal got through the line and blocked a punt that was then recovered and returned for a touchdown by Justin McDonald. The final exclamation point came in the fourth quarter on a 25-yard touchdown run by Jawon Hamilton. The defense kept the Bearcats to three points all day. Errol Clarke racked up three sacks on the day while Shaquem Griffin added two of his own. Offensively, Milton hit on 22 of his 34 passes for 150 yards and a touchdown and Hamilton rushed for 81 yards and a score on 17 carries.